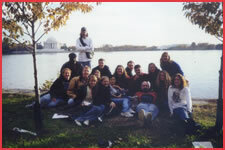 The next trip to the U.S. National Holocaust Museum will take place November 10-13, 2005. For more information contact the PCM office at 330-743-0439. "It is always a great experience to visit a new city. The fact that it is the capital of a nation makes it even more exciting. I was really excited about the road trip to D.C. It is such a beautiful city that I could spend a whole year there. We visited a lot of landmarks such as The White House, the Washington Memorial, The Lincoln Memorial, The Korean and The Vietnam War Memorials. But one of the most interesting places we visited was the National Holocaust Museum. It was amazing. The building was modern, but the shape of it made me a little scared. What I saw inside was shocking. I knew that people suffered a lot in those camps, but I didn't know the full extent. I know now that we have to do everything possible to avoid tragedies like this. And we can't let anyone cause that kind of suffering on other innocent people ever again. I recommend the museum for everyone. The road trip had another advantage for me. Since I am an international student I don't have much contact with American students. During this trip I had the opportunity to get closer to American students. I am really happy that I could meet them and make friends." "What I saw inside was shocking." "Upon entering the Holocaust Museum I first thought, 'how long before this tour is over so we can move on to something I can relate to.' It did not take long for those thoughts to change. I now have a newfound respect for survivors of the Holocaust and for all Jewish people. As an African-American I can empathize , but I could not realize what happened to these people until I visited the museum. Thank you for the opportunity."